In this day of the $6 cup of coffee, when bragging rights mean knowing not only the varietal but the beans’ latitude, anything exotic gets the antennae waving. Which may explain why Jay Ruskey of Good Land Organics is inundated with requests to visit his north Santa Barbara County farm, where he is the only person cultivating coffee in California. He’s been turning down the requests—until now. This month the curious can sign up online for an agritour and the chance to see how Ruskey coaxes a plant inextricably tied to Latin America and Africa to flourish on U.S. soil. The coffee-growing experiment is part of the UC small farms initiative, which supplied Ruskey with bushes and an expert, Mark Gaskell, who has worked in Central America. While coffee is normally grown at altitudes approaching thousands of feet, Ruskey’s farm sits at 650. The beans thrive in his coastal canyon largely because of the lack of extreme cold or heat and the low winds. He now has 470 trees in the ground, which would fill half an acre if they had been planted in a continuous block. By chance, he planted the young trees among mature avocado trees and found that the two were good companions, as the coffee benefited from the rich soil generated by the avocado trees’ mulch. …his mature trees are mostly Typica, the Arabica type from which most others developed, and Caturra, a mutation of Bourbon discovered in Brazil. He also has 100 young trees of Geisha, a rare Panamanian strain of Ethiopian origin, legendary for its superb quality. 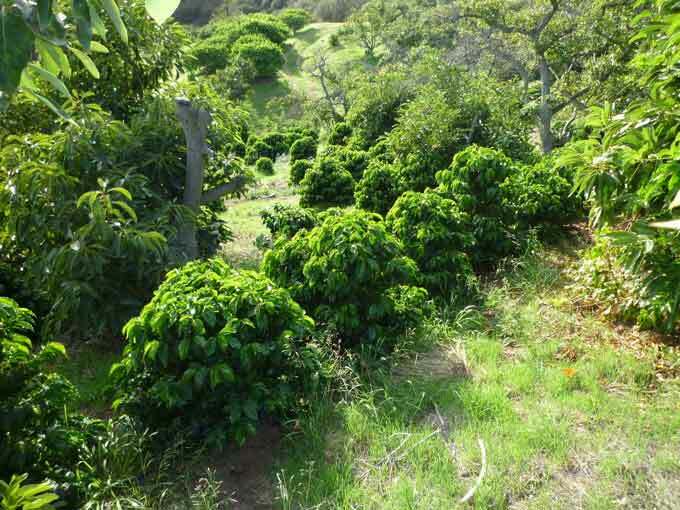 He is sufficiently convinced of the feasibility of his project that he and Gaskell are working to organize a Santa Barbara coffee growers association with several other farmers who have planted or committed to planting coffee trees. With all this talk about eating local and counting miles I thought it would be good to explain what it really means. The foundation for local eating starts with a foodshed. 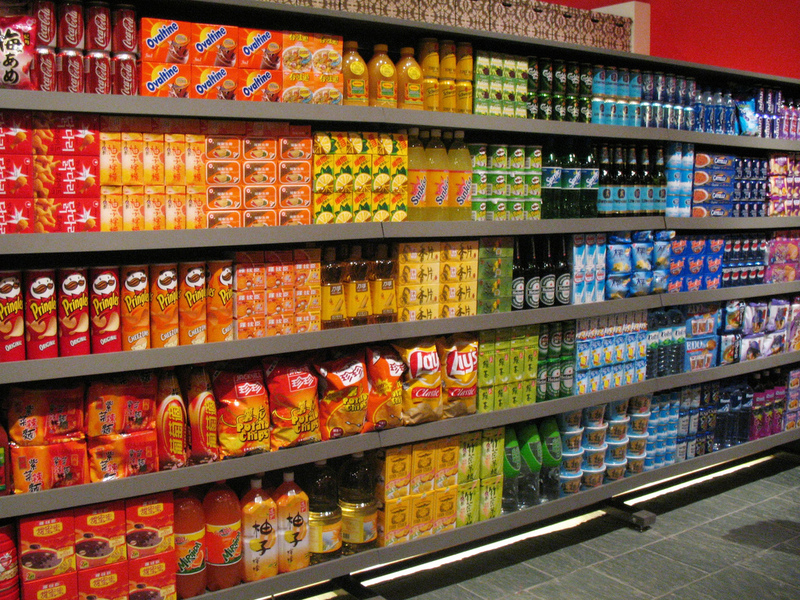 Foodshed: a region or area from which a population draws its food. The typical limit on these regions is 100 miles. 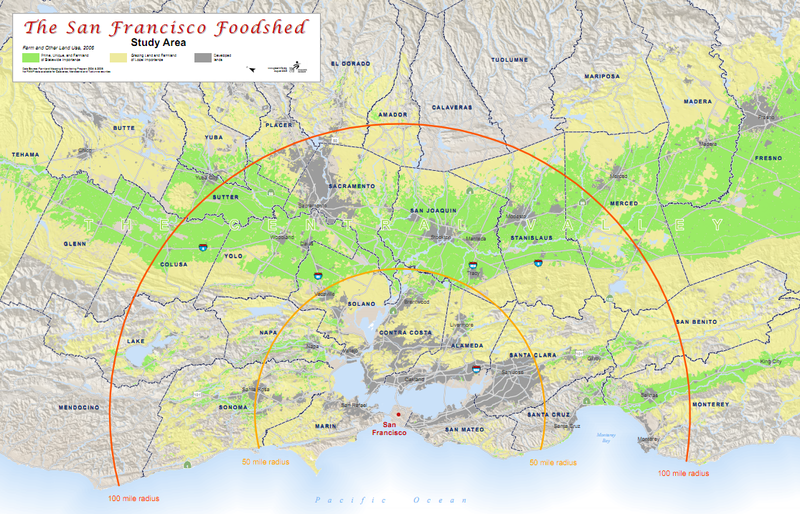 Draw a 100-mile circle around where you live and that is your foodshed. In economic terms this is ideal distance a farmer, or her goods, can travel to reach a market. 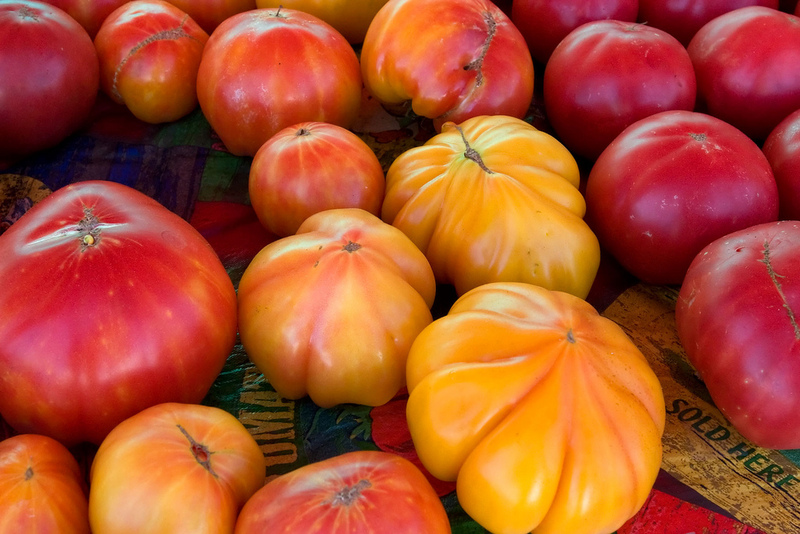 That way it arrives on your plate as fresh, ripe, and nutritious as it can be. 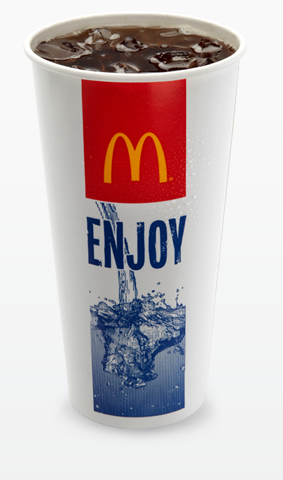 Go outside of this limit and there is an increasing reliance on fossil fuels and a decreasing quality of the food. For those concerned about pollution, global warming, or oil-addiction these “food miles” are a cause for concern. Farmers face similar concerns, albeit from the other side, with a rising cost of gas and oil-based fertilizers that narrow their profits. Still for others the “go local” movement represents a desire to get the very best food they can find, and that is the fundamental reason for foodsheds. I’ve tried to document what happens to our health with the advent of low quality food, our acceptance of it, and the difference in nutritional content. These rings of farmland surrounding our communities represent the ideal of sustainable living. Where the countryside is not poverty-stricken, but instead a vibrant economic sector known as much for its wineries and ‘farm-days’ as it is for fresh meat, vegetables, fruits, and nuts. Even more these areas are often recession proof as evidenced by their continual rapid growth during the past half-decade. It is for all these reasons that the locavore movement is popular and gaining momentum, there is something in it for everyone. Even the beefiest of meat eaters. For further reference I’ve pulled together several maps of America’s foodsheds. Take a look. I’m all about farmers markets. Every dollar I spend on food goes there and they provide me with everything I need to eat and more (dessert!). The reason for all this is covered in several previous posts, including: Why nobody knows how to prevent obesity & How food coma overcomes exercising. A quick recap is that by eating at farmers markets you gain superior health and weight loss, prevent global warming, and save money. For the longest time, I wondered why nobody else understood this. It turns out that since 2000, many, many more people are starting to agree with me. Notice that since the recession, the so-called “expensive” markets are surging with 164% growth since 2006. 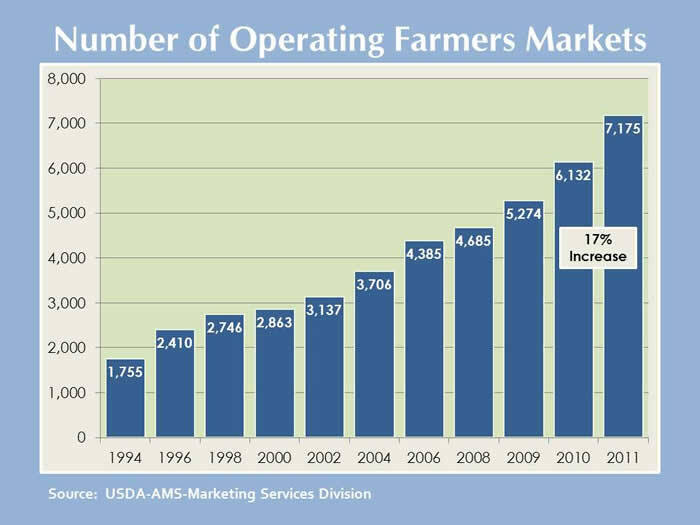 If this trend continues we may finally be able to impact our food system. I can already see it happening in the supermarkets where the words “farmer”, “market”, and “local” are everywhere. Too bad they are only marketing terms. So next chance you have, stop by a farmers market for the real thing. Pick out some fruits and vegetables. Come back the same time next week and keep the farmers market revolution going!